CAPE CANAVERAL, Florida -- There will be a Full Moon tonight on Tuesday, April 11, 2017, that is called a Pink Moon. Because Passover and Easter occur in April in 2017, this particular moon is also known as an "Easter Moon" and "The Paschal Moon." When will the Pink Moon happen? The 2017 Pink Moon will begin with a moonrise over the Atlantic Ocean off the U.S. east coast at 8:18 p.m. Eastern Daylight Time with a slight time variation depending on the viewer's exact location. 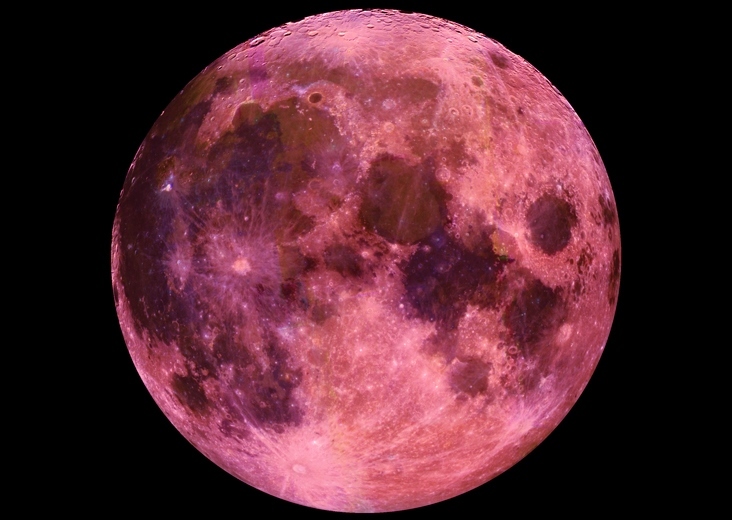 The Moon will be 99.9% full that night before setting the following morning at 8:01 a.m.
What does the Pink Moon mean? A Full Moon in April is also called a Pink Moon because Colonial Americans learned that name from Native Americans who associated the April Full Moon with the blooming of pink flowers in early Spring named wild ground phlox, according to the Farmer's Almanac. Other names for April's Full Moon are also associated with Springtime: Full Sprouting Grass Moon (sprouting vegetation in Spring), Egg Moon (animal mating in Spring), and Full Fish Moon (when fish spawn in spring). What causes a Pink Moon? The time of year that a Full Moon happens does not affect its color. The Full Moon on April 11, 2017 will likely be pearly-gray to most locations on Earth just like any other Full Moon. But particles in the local atmosphere caused by weather, forest fires, volcanoes, and pollution can filter out certain light colors of the moon. This is especially true when the moon rises or sets near the horizon and the sunlight reflecting from the moon has more atmosphere to travel through before reaching the viewer on Earth. Full Moons have appeared pink, yellow, red, blue, green, and (most often) orange. Below is a video of an April Full Moon that was pink when it first appeared over the Atlantic Ocean horizon. The Moon then changed from pink to orange (and later yellow) as it rose higher in the sky.